Really would like to thank you for all your efforts in putting together the tipping for the year! What a way to finish the year with what I thought was the closest game of the finals series. 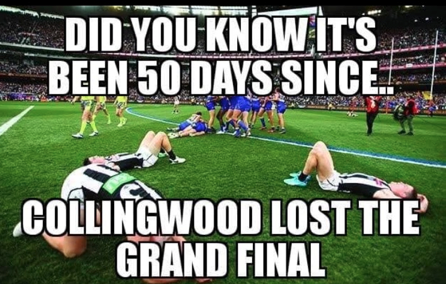 Well done to Collingwood for putting up a fight. I always enjoy putting the tips in and always look forward to the ladder results of our tipping. You're the man Al. Thanks heaps for doing this, it's an added extra to a great forum. Despite the fact that I have not participated in the tipping this year, I have enjoyed watching it, maybe I shall give you all something to think about next year. Thanks for your efforts for the year mate (again!! )...we all appreciate it. Al Bundy, thanks for your dedication and effort with the tipping competition. If the Collingwombles runner didn't block off their own player, it could have been a different winner. Thanks for another year of running the tipping Al. It's a huge effort, more than many realise. Oh... and thanks too for giving the Pies the 'kiss of death' with your tip. Despite the fact that I did not watch it, from the reports, both here and elsewhere, it was a hard fought game and either team deserved to win. It's amazing, really, that one small error could determine the outcome. that was only 1 of many missed calls during the day, high tackles, incorrect disposure of the ball, etc. These sorts of decisions happen in every sport all year round. But to be honest I feel that both sides had the chance to win without the umpires calls issues. To say Collingwood lost because of the umpire's bad call isn't fair in that their own runner helped them lose or they just slowed down. Tibi gratias ago pro tui conatus. Amor enim humor. Annum exspectantes. It’s been fun guys, I get to hang crap on you’se and don’t get banned , how good does it get. Okay, I know you all get you’re revenge because I barrack for Carlton, so I don’t have much choice but to stir the pot elsewhere to see what sort of reaction I get, I hope to see you all next year, and maybe a few more, in the mean time have a good Xmas, and a happy New Year. Thanks again, Al for hosting an entertaining year of tipping and baiting. I actually saw much of the replay on tv yesterday. It looks like it was a hard fought game, and either team deserved to win. At that standard (i.e. Grand Final) it s what you would expect from a game. Of course there will be mistakes by all sides, including the umps, given the pressure all are under, as long as it is fair and balanced, then it's a good game over all. Well done to both teams. Phaww, that's a bit rough, but I like it.